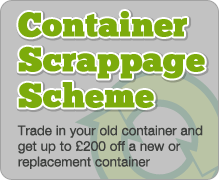 10ft containers come in a new or used condition. Some (mainly new) 10ft containers are purpose built from factory that size, the majority are cut down from larger containers such as 20 foot containers or 40 foot containers. When a standard size container is converted into 10ft you are given the choice of original double container doors or pre-fabricated flat panel doors. At Bullmans our 10ft container conversions are always supplied with original container double doors, a lock box, fully welded seams, forklift pockets, lifting lugs and an exterior respray in the dark colour of your choice from green, red, brown, blue or grey.